Please take a minute to see the different varieties of entrees Seoul Galbi has to offer. Here are Seoul Galbi, we offer you the choice of either All You Can Eat or classic order from your menu. 1. 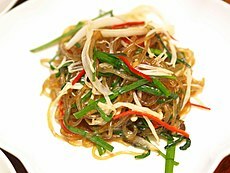 Japchae (잡채) a favorite amongst the locals that is stir fried in sesame oil, soysauce with cellophane noodles (dangmyeon), and various thinly sliced vegetable: onions, carrots, spinach, muschrooms, meat or seafood. All working people's favorite. delicious, tasty and reasonable! Enjoy the most delicious lunch that your money can afford! All order plates come with steamed rice, fresh salad and soup. The signature dish of Seoul Galbi beef short ribs, this irresistable barbeque is offered marinated or non-marinated (saeng galbi). Galbi would be the most popular variety of Korean barbeque. The authentic Seoul galbi marinate contains soysauce, water garlic, sugar, onions and the signature herbs and spices. Cooked at each table to enjoy its freshness and delightful taste that Seoul Galbie has to offer. Each order is hand fillet by our master skilled carver as he thinly slices a uniform cut of beef rib. They are then inspected to insure specific thickness desired for Seoul Galbi. literally means "fire meat" in korean due to the cooking technique over an open flame. Enjoyed with garlic cloves, onions, sauces, with an option of lettuce to wrap. 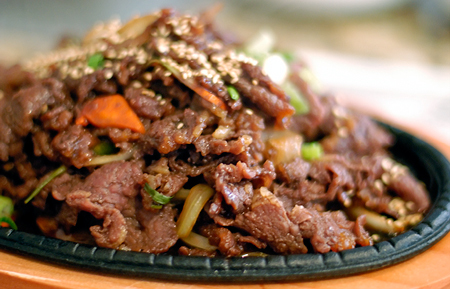 Bulgogi is made fron thinly slices of sirloin and other prime cuts of beef. Similar to galbi in marinate (soy sauce, sesame oil, garlic, pepper...) to produce a flavor and tenderness of its own. consists of chili peper and paste, garlic, onions, sesame oil. Very famous in Korean barbecue dishes with the absence of soy sauce. thinly sliced beef brisket, which is not marinated. It is so thin it cooks nearly instantly as soon as it is dropped onto a heated pan. Again sesame oil and salt is the popular seasoning. basically comprises thicker strips of unsalted bacon , pork belly. 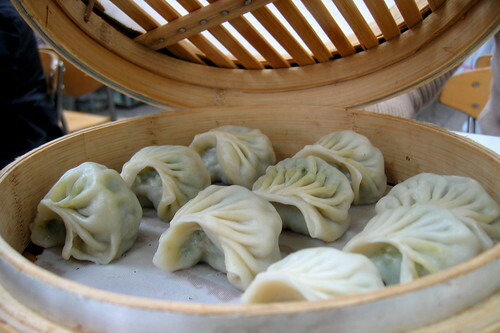 Tender and juicy, most prefer to add sesame oil and salt for seasoning. A popular barbecue in Korea. There are two different varieties of Korean barbecued chicken. 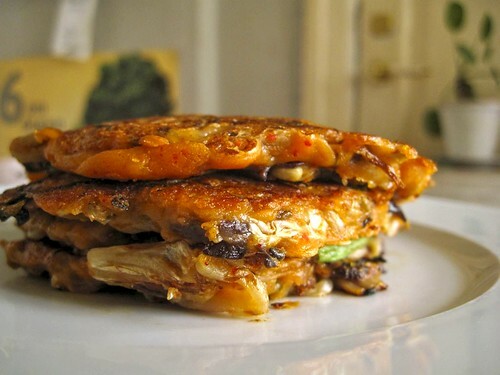 One is made with marinated chicken, using a marinade similar to that used for galbi, and is grilled, producing a flavor similar to chicken teriyaki. However, a more traditional and popular kind of chicken barbecue more closely resembles a spicy chicken. It is typically served along with a variety of pan-fried vegetables. Korean soup comprised of slow stewing beef short ribs including daikon, onions, and seasonal vegetables. 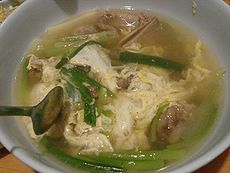 A clear and hearty soup, slowly cooked for tenderness and taste. D2. 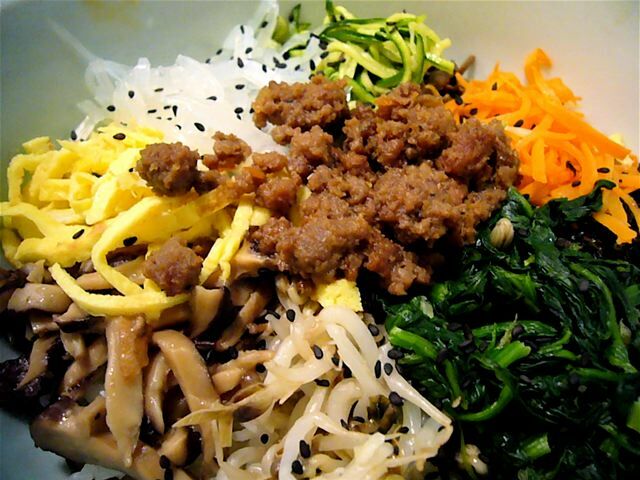 Bibimbap (비빔밥) "mixed meal"
served in a bowl with warm rice, korean seasoned vegetables and gochujang (red chili peppe paste), and meat, then mixed. 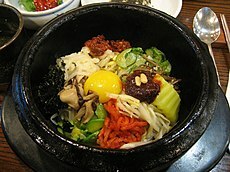 Bibimbap in a hot stone pot that cooks the raw egg and producing a crispy rice treat due to the hot pot. The sesame oil cooks the outer rice closes to the stone pot which is a special treat for those who enjoy. 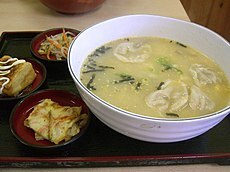 Korean soup with mandu (dumplings with ground meat and vegetables) in a egg beef broth. An old tradition in Korea. Manduguk with tteok, Korean cake that is made from sweet rice (chapssal). Korean spicy soup with shreeded beef and vegetables. Slowly simmered, this hot and spicy soup is refreshing along with banchan and rice. 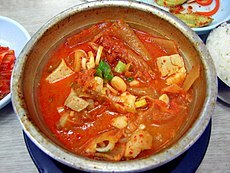 This stew/soup is made with kimchi, onion, tofu, meat or seafood, scallions (spring onion) in a boiling hot stone pot. This soup is often shared from the center of the table. 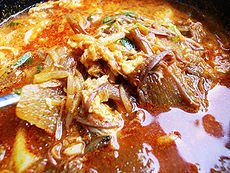 Stew-like dish in a hot stone pot with doenjang (Korean soybean paste), tofu, vegetables. A common amongst the natives. 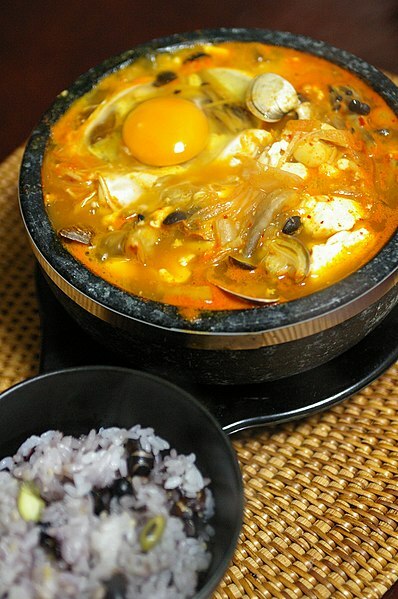 Hot and spicy, this Korean stew (jjigae) is made with tofu (uncurdled), onions, mushrooms, vegetables, and your choice of meat or seafood. While still boiling, a raw egg is added upon customers approval. Copyright 2009 Seoul Galbi Korean B.B.Q.. All rights reserved.